Cook the healthy, authentic Indian classic in 30 minutes without having to shop for exotic ingredients. One of the most popular dishes in the world, Indian chana masala—chickpeas cooked in a spicy, tangy, tomato-based sauce—is easy to make, if you have all the ingredients on hand. 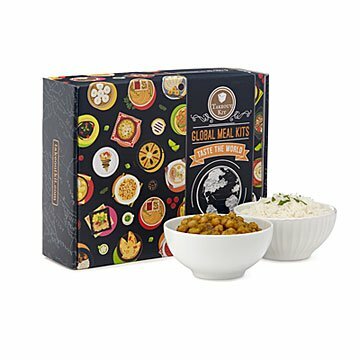 But if you don't, and you'd love to try Indian cooking without having to track down Himalayan basmati rice, coconut cream, organic ghee, and garam masala, Rachael Lake's complete meal kit is for you. Inside is everything you need to make the delicious Punjabi classic—with just the right balance of spice, acidity, and sweetness—in about 30 minutes. The box's contents are shelf-stable, so no worries about wilting or spoilage, but if you'd like to add optional fresh herbs, etc., the easy-to-follow recipe card tells how. Low in effort, high in flavor and nutrition, it'll impress everyone you make it for, including you. Makes 4 adult servings. Hand assembled in Sunnyvale, California, from global ingredients.